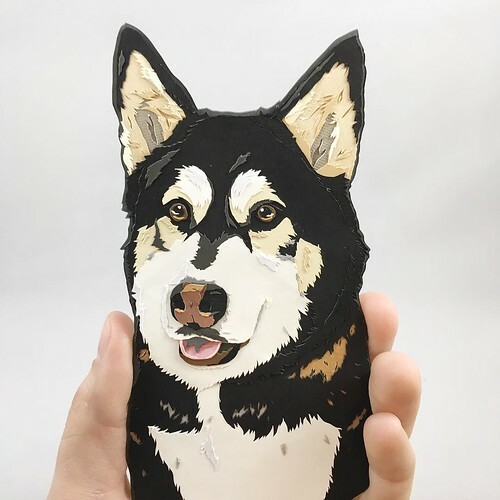 Bringing a paper artist to your attention who has carved out a clever niche is one of my favorite things to do... such is the case with Megan Mead of Texas who goes by the name paperpups on Instagram; her Etsy shop is Paper Pet Art. Almost everyone I know has a special pet, whether it lives in their own house, that of a relative or friend, or maybe only in their memory. Thus, Megan's knack for creating realistic portraits from small snips of paper appeals to many of us. 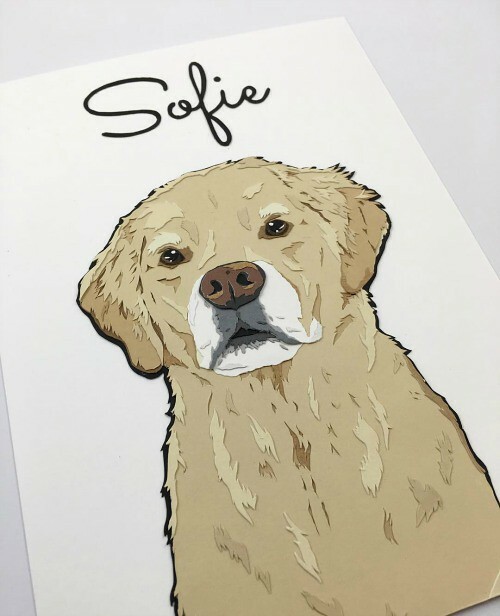 Judging by the rave reviews her work has been receiving on Etsy and social media, she is able to capture not only an animal's fur pattern, but its personality as well. Megan refers to a photograph or two to create the layers and often adds a hand cut cursive or block letter name. 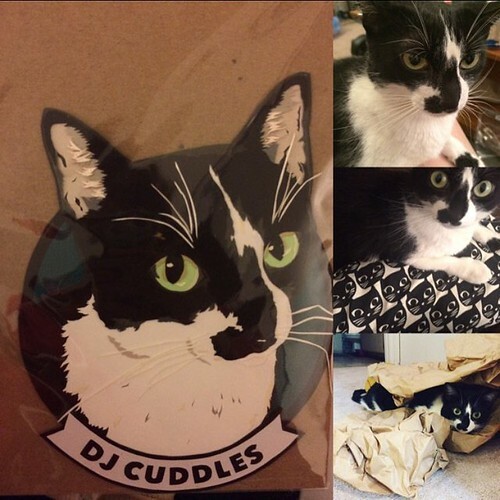 I wrote to ask her how she got her start cutting portraits, and what she enjoys about doing this type of art. 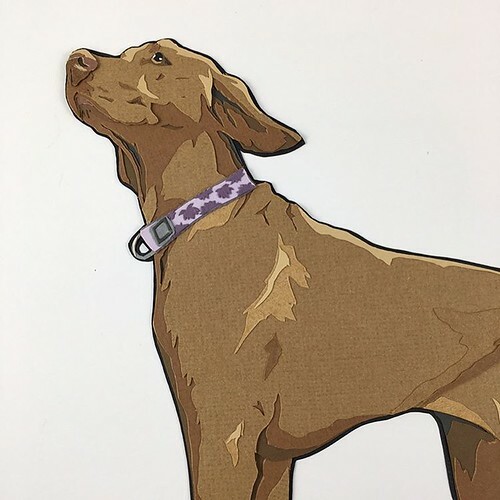 What prompted you to begin creating cut paper pets? I started making paper animals in January of 2015. 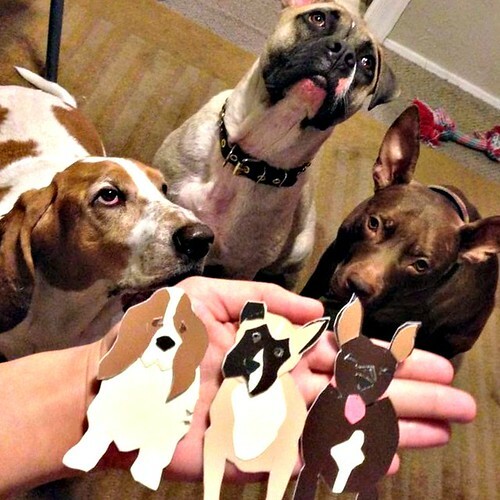 I made our two dogs and our foster dog just for fun out of paint chips. 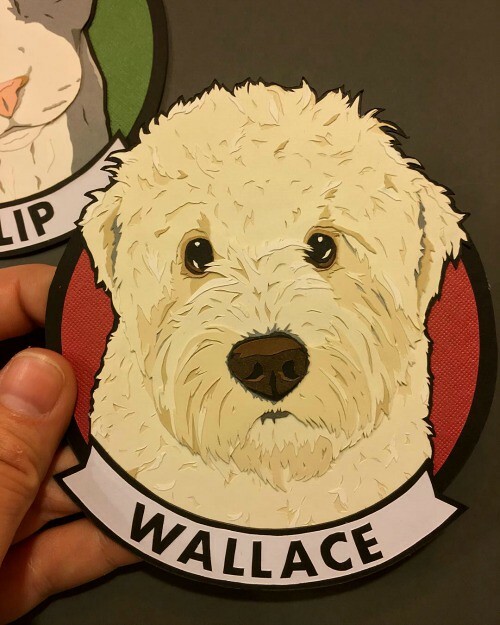 The post was so well-received by my dog-loving friends that I got requests to make more. Our foster dog, Daisy (middle dog in the picture), had just had FHO [femoral head ostectomy]surgery and needed swim rehab to rebuild her muscles to compensate for her lost joint. The swim lessons were over $1000 in total and I knew the rescue didn't have the funds available after paying for her surgery. 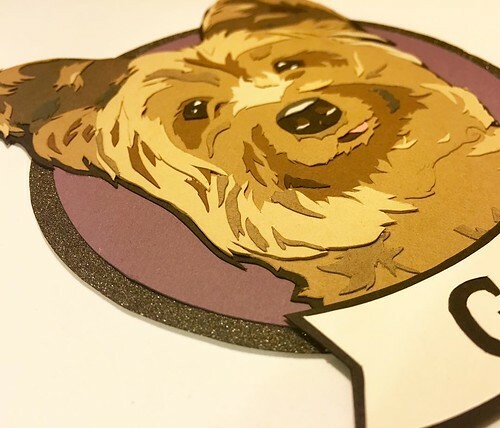 That launched me creating these comically small detailed custom paper animals for a donation to the rescue. 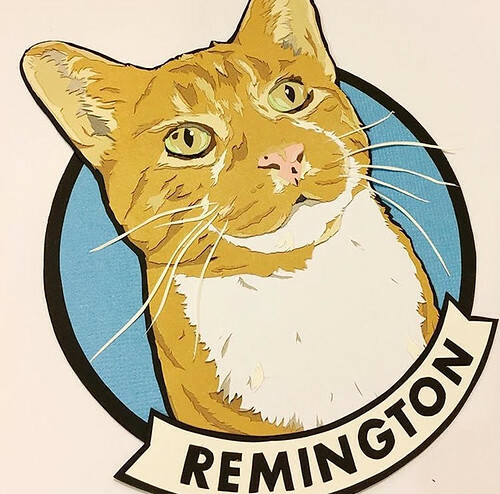 In just a few months, I raised $2000 for the rescue! I stopped using the paper animals to donate to rescue early in 2016, but that is how it started. Do you have formal training in art or did your natural talent as a paper cutter emerge as a hobby? In college, I wanted to be an art major, but unfortunately my parents did not agree with this. I took a few classes, but ultimately majored in economics. I never was taught anything about paper art in any of my art classes, however! It has been entirely self-taught. Tell us about your own dogs. 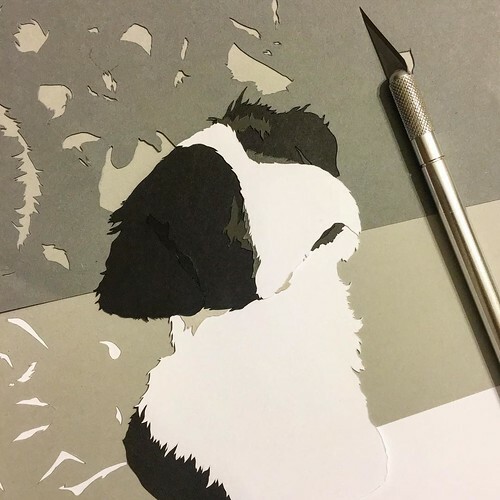 You mentioned doing paint chip art of them... have you created paper cuttings of them too? One of my dogs is a very lazy basset hound named Ellie, the other is an energetic and feisty pit bull named Canada. I've done paper cuttings of them, but they are older and lack a lot of the details I'm more proud of now. Do you have favorites of the cuttings you have done for clients and if so, why are they your faves? 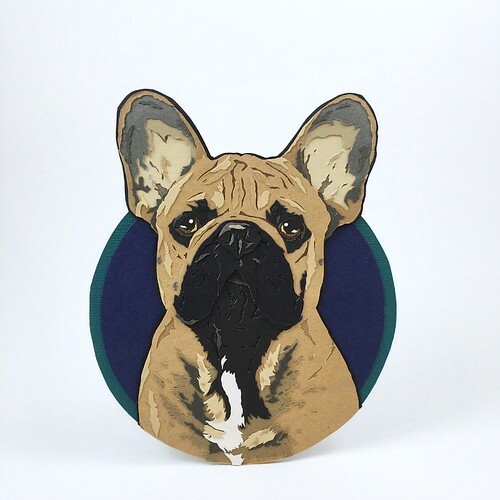 I think the ones that are most fun to create are the dogs with wrinkles--like pugs, Boston terriers and bulldogs. I like cutting the layers for them! Megan creates more than just dogs and cats... "ferrets, hamsters, horses, goats are a-okay and welcomed." 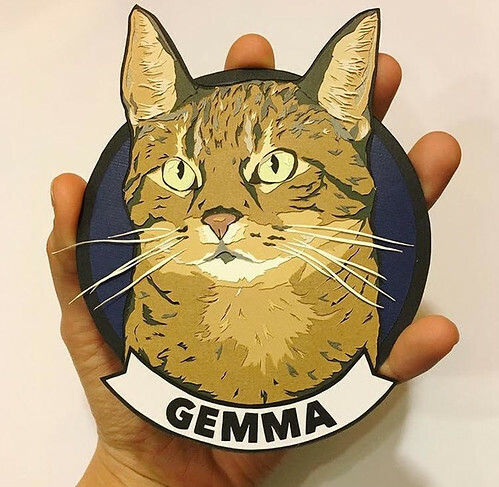 Circular portraits are about 4.5 inches in diameter, while her matted portraits are 5 x 7 inches with the size of the paper pet varying. Each portrait is coated with two coats of clear UV protectant to prevent fading. 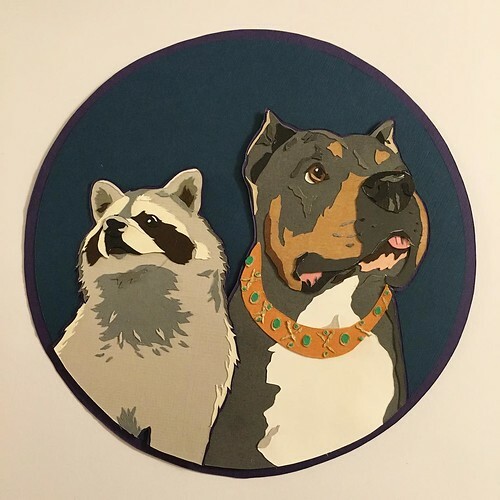 Megan Mead of Etsy shop Paper Pet Art is on Instagram and Facebook. These are just wonderful! 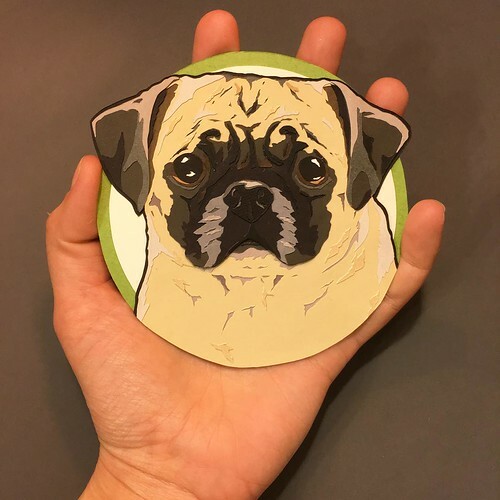 So beautifully cut and they really seem to capture the pet's personality. These are amazing! 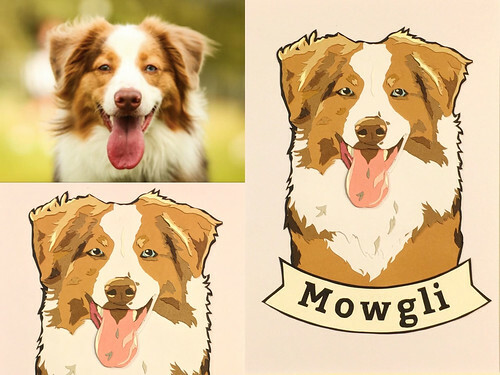 As a papercutter and dog lover, I'm swooning! Well done! I'm so glad you like them, Lisa and Marnie... as fabulous paper cutters yourselves, your comments mean a lot! They are so intricate and beautiful.There's so much detail and dimension to them. I just love that pug one.